So Tuesday night a girlfriend and I went out to a Japanese Steakhouse for sushi and martini night. I've just recently discovered my fondness for sushi. (Who knew?!) But my friend introduced me to something that I now can't get enough of. Edamame is basically immature soybeans still in the pod. The pods are boiled and salted. You squeeze the pod and the tasty little bean pops into your mouth. It's heaven. After eating edamame as our appetizer before sushi, I was completely addicted. But where would I get edamame? My friend had searched the various grocery stores in town to no avail. 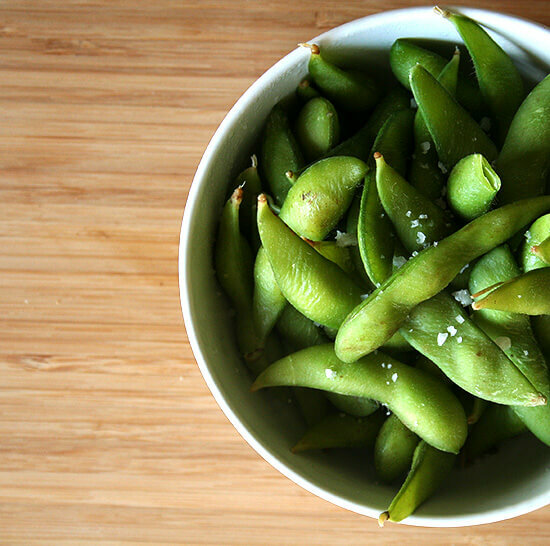 I woke up this morning with an insatiable craving for more edamame. So I decided to hit up the Asian Food Markets in my town. The first one was a win. The edamame comes frozen in a bag---and only $1.50 per bag!! I was so excited that I couldn't stop smiling at the Asian cashier who probably wondered what the crazy American girl was so happy about. Then I hurried home to make my edamame. First, Boil some water. When the water is boiling, throw in some salt and some Sichuan pepper if you have it on hand---I had it on hand because my roomie is Chinese and she suggested I add it. ;) Add in as many soybean pods as you want. Let 'em boil for a good 5-8 minutes so that the beans inside are tender. Drain off the water, toss 'em in a bowl, and liberally sprinkle on the sea salt. Start eating! They can be served hot or after they've cooled down. I know this sounds too easy to be true---but that's why I'm so psyched about. The best part? Edamame beans are rich in carbohydrates, protein, dietary fiber, omega fatty acids, and micro-nutrients like folic acid, manganese, and vitamin K. They're a yummy snack with a nutritious punch! Love those! Trader Joe's carries them, too! Edamame is delicious, and here in GA you can buy it in the frozen "green/organic" section of most all grocery stores, in fact you don't even have to boil them, you can steam them in the microwave. However, be careful consuming these little delights too often, soy contains estrogen and too much (like several times a week) can affect your hormone levels (ie period, thyroid, etc) it happened to a friend of mine. I <3 edamame too! Tis yummy and healthy. Another nice side to go with it is sticky rice. It's incredibly easy to make and fairly cheap. It does require a rice cooker, but those are like $15 - $20 for a small one at Target or Walmart. Just mix 1 cup rice, 1 1/2 cups water, and a pinch of sugar in a rice cooker and wait 20 minutes. Then nom!